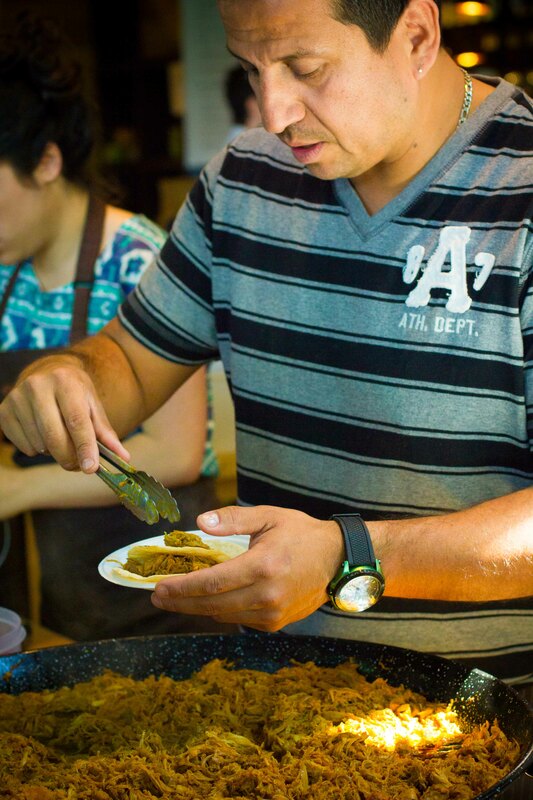 My weekend in Montreal was spent mainly wandering around the city to conquer some of its famous eats. There were some places that everyone said I had to visit and a couple that came highly recommended from trustworthy sources. With my map in hand pointing me towards Montreal’s favourite spots, I set off with an empty stomach hoping to fill it with tasty treats. 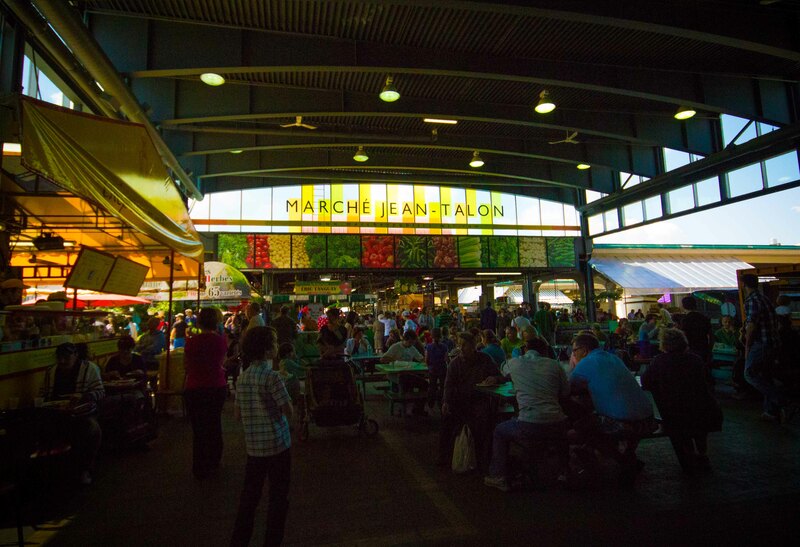 We arrived at the Jean Talon market late morning and we meandered through the glorious aisles of food. This is an impressive market, and after getting my fill of samples of sweet tomatoes, we decided it was time to have a real snack. I had my eye on one stall, while Ben’s were clearly in a different direction. Ben couldn’t resist the big cauldron of pulled pork. 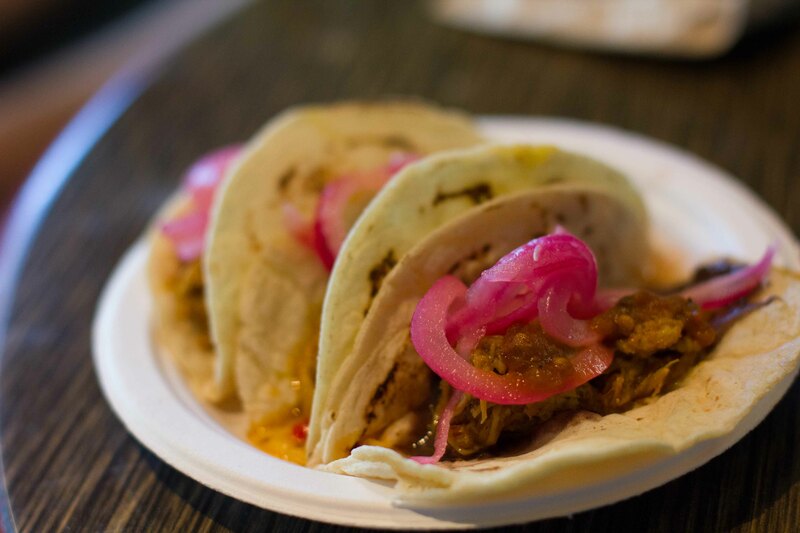 The moist pulled pork tacos with refried beans and pickled onions were good, especially topped with their spicy salsa. I had less than my share because I was saving myself for something else. Oysters! I am a sucker for oyster stands in markets. 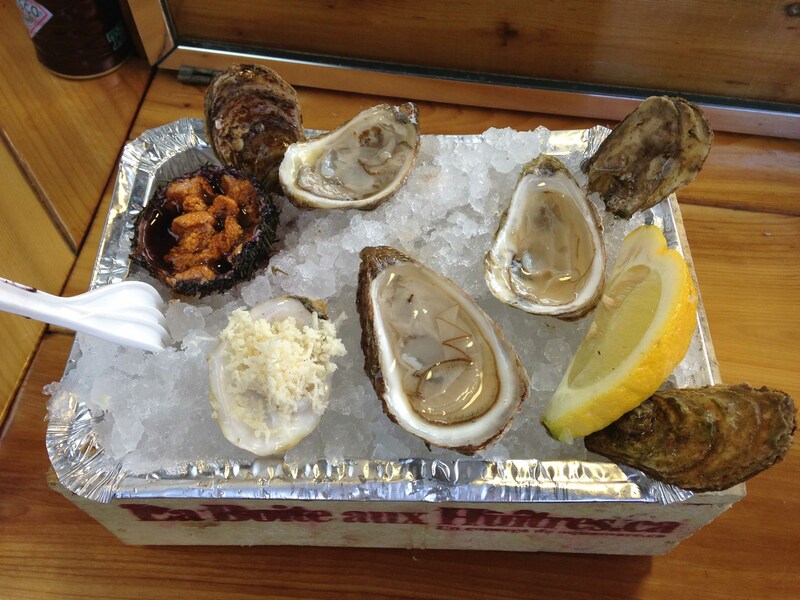 3 oysters + 1 sea urchin = my idea of a perfect snack. I would never have found this on my own, but this recommendation came enthusiastically from a trustworthy source. I wouldn’t have gone out of my way to find it, but we happened to walk by, and the buttery aromas drew me in before I realized it was a pinpoint on my map. 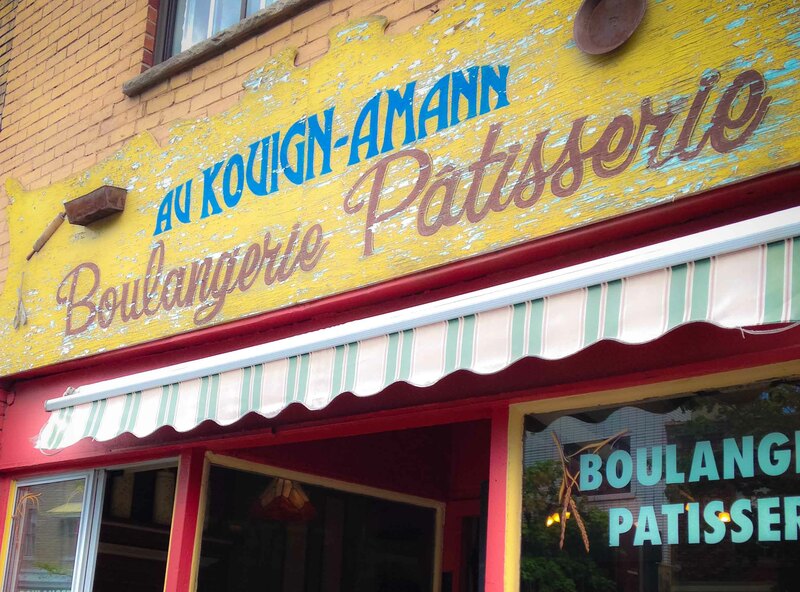 The croissants looked amazing, but the Kouign Amann on my list. Underneath the crackly caramelized sugar top were layers of buttery pastry which were excessively rich and a guilty pleasure. 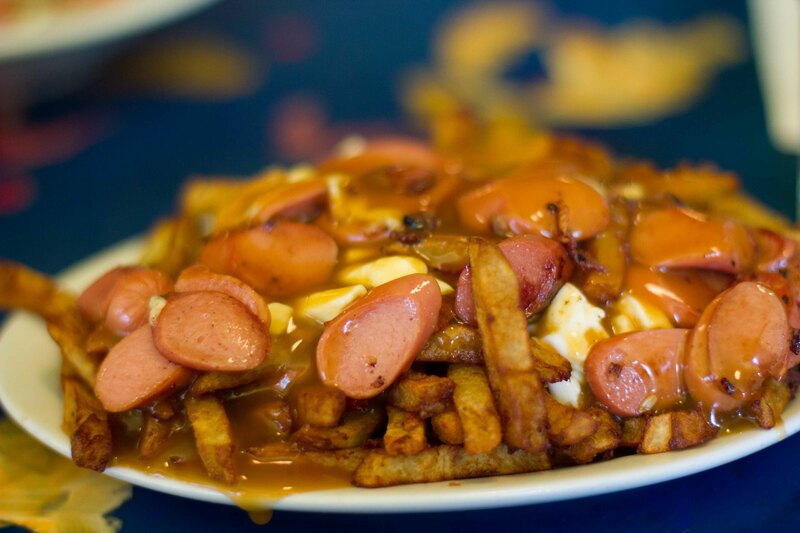 Before my trip, whenever I mentioned to people that I was going to Montreal, they said I had to go for poutine. The consensus was that poutine in Montreal is SO MUCH BETTER than anywhere else. I was skeptical of this statement, but wanted to be convinced of it myself. Now, don’t get me wrong, I’m not a food snob who’s too good to appreciate a dish made of fries. I love fries and my favorite way of eating fries is with gravy. As a child, 2 of my favorite places to eat were at the Woodwards cafeteria and A&W for the fries and gravy. I will admit, that with all of the poutines I’ve had in the past, I’ve been indifferent with the cheese. I have never been woo’d into thinking the squeaky cheese curds adds more deliciousness to the wonderful combination of fries and gravy. I had to be strategic in my planning, because as much as I love fries, I don’t allow myself to eat them very often. So when I planned for this trip, I knew I’d only stop for poutine once. I put 2 choices on my list, but after walking around the Plateau on a Saturday afternoon, Ben and I decided to try the most famous poutine at La Banquise. It was busy, but we got a seat right away. I looked around in horror at how large the plates were. We were hungry but knew our stomachs couldn’t handle a plate of poutine each. We chose 1 and ordered a salad to share. Yes a salad… We were “those people”. 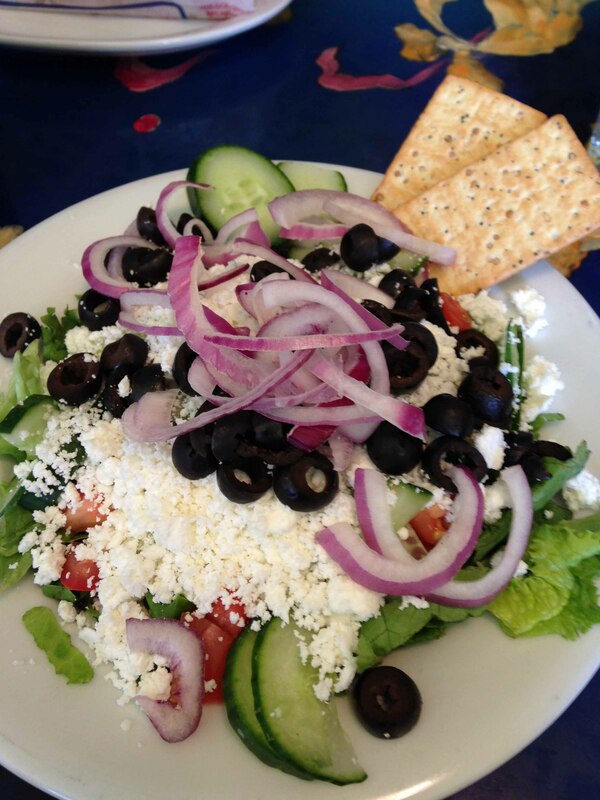 It took a long time for our greek salad to be delivered. I think they had to go buy the ingredients because I doubt anyone ever orders a salad. To their credit, it was quite good. We saw crazy variations of poutine but stayed on the safer side because we didn’t want to interfere with the main components of the dish. The poutine was good, but not necessarily a notch above any other poutine I’ve had outside of Quebec. As we walked back to our hotel, I still felt like I’d like to find the “great poutine of Montreal” that I’ve heard people talk about. That meant that I’d have to put poutine back on my list. When I realized I’d be adding another plate of fries to my dining itinerary, I picked up the pace to a brisk walk hoping to burn additional calories to compensate for the copious amounts I’d be eating this trip.